Natural Hair Growth for 5 Years: It’s been Rough! So it is June 2013 and last month marked the end of my five year natural hair growth stint. Now I'm going to cut it. I'm so sick of it now....just kidding I'm going to continue to grow it long. I prefer long hair for the simple fact that it just complements my face shape and size. Trust me if I could get away with shorter hair I would. 1) Monitoring any process that takes a long time can be like watching paint dry so therefore I had to learn to focus on other things. Lately weight loss and healthy eating along with indoor gardening have grabbed my attention. With other things to focus on, there’s less of an obsessive tendency to measure your hair every five minutes which I used to do in the beginning. 2) My coils have a Sloooowwww natural hair growth rate and that is okay. I would average out 1-3 inches a year. Each year being less consistent than the next. I also accept as my hair gets longer my shrinkage seems to increase. I know that my hair is longer yet it curls up so much even more than before...utterly ridiculous…but that is the way it works. Pay attention to all breakage and setbacks stink! 3) I applied heat earlier this year to my hair and paid the price for it with breakage. (I know I shouldn’t have done it, but I saw the brass ring) It looked good, but definitely I had been here before and really have to understand that my 4b hair will not stand heat, comb attachments for dryers, or combs of any kind . Even touching my hair creates breakage and it can be really frustrating. Another setback this year was with a Mizani hair product. I was using Hydrafuse and Kerafuse. These products may work well for others, but they didn’t work well for me. I mixed it in the appropriate combination (or at least I thought) and experienced a lot of shedding and breakage. I don’t think a product has ever done that to my hair. Usually I’m the one to do the damage, but would you believe I continued using the product a second week because I thought I mixed it wrong? If something doesn’t work, throw it away. 4) Consistency always wins the race. I am not always consistent with my hair routine. With all of the advice on my site and everything I have read, I still was drifting into very bad and very old habits whether I was trimming my hair like a maniac or seeing broken hair and still continue to do what I used to do. 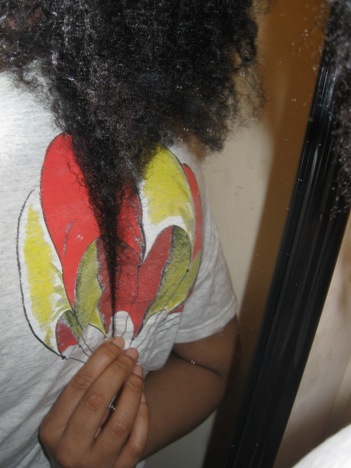 5) Moisture creates shrinkage yet will save your hair from breakage. There were many times when I was styling my hair and I didn’t want to mess it up by spraying water on it. However, it was very dry and the ends broke as a result. My hair will become dry five minutes after I moisturize it which delays natural hair growth due to breakage. Honest. I can moisturize it at night. Wrap it up and then have dry hair in the morning. . I really don't believe there is anything I really can do to eliminate breakage permanently. Yet, at the same time I believe I can reduce the amounts of it. 2) Wear no manipulation styles – Meaning no combing or brushing to achieve or maintain a style. This could include a wash and go, braids, weaves, wigs—whatever style can protect your hair and not damage it. Pick your poison! 3) Routine cleaning of hair to ensure hair health. Ladies and Gentleman, I have experienced growth. I was really impressed at how my hair grew from June 11th to July 29th. Above were my June numbers and for July 29th, here are the numbers now. Unreal! So my routine included box braids for the most part. I would use Chicoro's washing, conditioning and styling methods. See here for an interview. Then I would stretch the hair overnight and then braid it when my hair was air dried. My hair really is antisocial and doesn't want to talk, deal or relate to me in any way shape or form. When I leave it alone in braids, and simply spray it with water and seal it with a concoction of castor oil, grapeseed oil, coconut oil and rosemary essential oils, it thrived. By giving my hair what it needs without the heat, combs and manipulation, it really grew on its own. So don't lose heart people. I thought I had reached my terminal length especially after the 5 year journey, but realized that this hair may still have some growth in her. Stay tuned for more results in August. Wow.. so I don't know what happened in October. I am writing this in January 2014. Apologies for the vicious delay! My hair again this month has experienced a serious setback, but I am not freaking out because that won't bring the hair back. All I can really attribute the hair loss to is stress perhaps or poor practices. I really don't know. I have to remember that while long hair is a goal consistency always wins the race. And looking back I know that I wasn't doing anything consistently in October.